A “General Dentist” refers to the primary care provider for dental patients in all age groups who take responsibilty for the diagnosis, management, and overall coordination of services to meet their patients’ oral health needs. These oral health care needs include: fillings, root canals, crowns, veneers, bridges, gum care, as well as preventative education. When necessary, General Dentists refer more complex or challenging treatment to specially trained dentists such as Periodontists for gum treatments, Oral Surgeons for tooth removal or Prosthodontists for challenging restorative situations. Dr. Michael Kaczor offers you and your family general dentistry services focused on preventative and restorative care. 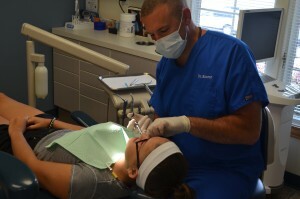 These services include dental cleanings, examinations, fillings, sealants, and fluoride treatments. It also includes tooth replacement and restoration of teeth using implants, crowns, bridges, or removable appliances. General dentistry services are fundamental, and when combined with regular brushing and flossing, help prevent dental disease. It is important to schedule a visit to the dentist for a hygiene appointment at least every six months. Dr. Kaczor may recommend more or less frequent appointments depending on your age, lifestyle, risk factors, and general oral and dental health.